As should be fairly self-evident, living in a foreign country almost invariably presents a number of challenges. The exact nature of these obstacles and how difficult they are to adjust to depends on a number of factors, such as which countries one is moving from and to, personal adaptability, profession, language ability, etc. From now on I'd like to periodically write about some of the challenges that I and friends of mine have faced in Japan, and hopefully provide some resources and/or advice in each case. It's my hope that this will be of help to someone living in or planning to live in Japan. Since coming here and adjusting to living alone, I've found myself becoming more and more conscious of healthy living. When there's no campus dining hall or mom to cook for you, you basically have three choices: (1) Eating out all the time, (2) Buying pre-made stuff like sushi or sandwiches every day, or (3) Manning up and learning how to cook. Options (1) and (2) can both get expensive and unhealthy, and they don't add anything to you as a person. I think you can see where I'm going with this. I'll save cooking tips for a future post. First, I want to talk a little bit about how my diet has changed since coming to Japan. It's a frequent observation that Japanese people are generally much thinner than we in the West. I credit several factors for this trend, but diet is no doubt an important part of it. Aside from eating different foods, Japanese people eat less. Sometimes this means smaller portions, but what I have in mind is snacks. In my experience, Japanese people don't chow down between meals as often as we do in the States, anyway. I've attempted to drop this habit recently. We eat for a lot of reasons aside from hunger - boredom, depression, social interaction. Reading about the science behind some of it makes you think. Cutting out snacks can be tough. Sometimes you just want to eat. I know - about an hour ago I was going to town on a big bag of pretzels I got at Costco. I think the trick, however, is always trying to keep nutrition in mind. Tangerines make good, healthy snacks. Bananas, too - those are filling. But if you really need something less healthy and yet don't want to go overboard, read on. Before I link this more fully to living here, another, related challenge I have encountered has been trying to adjust my diet in conjunction with my exercising routines. There have been times during the past year when I have wanted to put on muscle. Protein and calcium are important for getting strong. 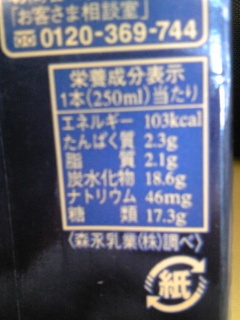 But how the hell do you know what your body needs when all the nutrition facts are in Japanese? And what about trying to make sure you're getting enough vitamins and minerals? One thing I frequently miss about life back home, as insignificant as it sounds, is the availability of nutrition labels that provide Percent Daily Value information. Ok, these yogurt raisins have 12.9 g of fat, but what percentage of your daily allowance is that? If you don't know how much fat is okay to eat per day, knowing that you just ate 12.9 g means absolutely nothing to you! Reference values for nutrition labeling: How much should you get each day? Unfortunately International Units (IU), which are used in a couple places, are pretty ambiguous. But then I doubt you're going to be monitoring your Vitamin A intake that closely, so let's move on. Ok, now that you know you should probably be eating less than 2,400 mg of sodium per day, how do you figure out how much sodium that Men's Pocky has? Well, if you're good at Japanese then you're dismissed. I promise you there's nothing amusing from here on in - just stuff you already know. If you can't read Japanese, or don't know the words for stuff like calories and sodium, here's some nifty information for you! 全粒粉 - if you find this one on a pack of bread, it indicates whole wheat. Snag that! 脱脂乳 - skim milk. Unless you enjoy drinking cream-like cow juice, I recommend looking for this. Update: Tim adds - "Don't forget high fructose corn syrup. That crap is in everything 果糖ぶどう糖液糖. But it is usually just the last 2 kanji, 液糖." Update (1/13/11): I had been thinking about adding this addendum for a while, forgot, and then Orchid at 1000 Things About Japan wrote an entry on labeling information and reminded me. It's important to pay attention to labeling and serving sizes. As Orchid notes, different products measure serving sizes in different amounts. The amount is noted with the nutrition information, but figuring out the total property values isn't always straightforward. Above is a blurry photo of a box of Kilimanjaro Blend coffee. The label notes that the values correspond to one juice box (1本), which is 250 ml. Sometimes, though, the information will refer to 100 ml, or 200, or some other arbitrary amount. And the total contents may not be printed clearly on the front of the label. In this case, you must look on the back for 内容量, which means "amount contained." It will usually say something like "内容量: 500 ml." Also, sugar is not always sugar. In America, I believe labels usually specify how many calories are compose of sugar. In Japan, though, many times you won't see the kanji for sugar (糖 or 砂糖 or 糖類). You may only see 炭水化物, carbohydrates. But if you're eating or drinking something sweet, chances are many or most of those carbs are actually sugar. Update: 3/9/11 - new post related to nutrition. Beware of vague labeling! Don't forget high fructose corn syrup. That crap is in everything 果糖ぶどう糖液糖. But it is usually just the last 2 kanji, 液糖. Good point - I'll add that one. very unique and useful blogpost. Not in Japan but I am a label reading freak. My high metabolism and love of walking keeps me slim but you can never learn too much about nutrition. Thanks - yeah, I luckily have a pretty quick metabolism as well. Useful for cutting a slim figure, indeed. Don't forget how they put calorie counts on everything. It's super convenient to have the calories of food on menus in restaurants. Actually, I do have one issue with Japanese nutrition labels. Unless I'm blind, there's "serving size" but not "servings per container" on the labels. Many times it'll say that the nutrition info is for 100ml of juice but then it won't say anywhere how much juice is in the bottle... I guess I have to measure it out myself. Yeah, true. It works fine for the 500 ml bottles, but any of those little juice boxes or cartons you have to figure it out for yourself. I think it's more about portion and higher fat content than not snacking. At my office, the women snacked everyday. In fact, there was a tea time set aside for people to snack and many of the women hoarded souvenir snacks (bean cakes, sembei, chocolates, etc.) that were given to the office by traveling sales people so that they could eat them all by themselves. That being said, they rarely ate a lot. Most of the time, a snack was one cracker, one piece of candy, or part of a bag of chips. They never ate the entire quantity. If you take a week to eat a candy bar, you're unlikely to gain weight. I often think that the low fat movement in the U.S. did a lot to damage eating in the States. Fat makes you feel full. There is a fair bit of fat in most Japanese processed food. They don't shy from it and I think it allows them to feel sated with less. Carbohydrates and sugar without fat is a recipe for blood sugar fluctuations and feeling constantly hungry. Hey, thanks for stopping by, Orchid. Yeah, I think you're right about portions and fat content. I think there are a lot of factors, though. Interesting point about low fat foods in the US - I never thought about that before. I currently live in Japan and have been looking for these labels in Google translate. This page has been very useful and now I won't be wondering or guessing what I'm eating here. Glad I could help, Kriston! Just stumbled upon this in my search of info of how to decipher japanese food labels after a failed attempt using my dictionary, such good information thank you so much for sharing! overall, how did you find the adaptation to a healthy diet as a westerner living in japan? look forward to possibly connecting with you and finding out more! Thanks for commenting. I'm glad this helped you out! If you have any other questions, feel free to comment again or shoot me an email. Oh, and good luck to you on your exchange - I'm sure it'll be awesome!